View of the coastal cliff perched 16th hole of the Bandon Dunes Course with exposed cliffs that have to be negotiated on the tee shot of this spectacular signature hole of the Bandon Dunes Course. The hole has two fairways for strategic shot planning. This hole is a short par 4 that can be reached with a challenging long drive when the wind is from the north. Bullard’s Beach State Park is the landscape beyond to the south. The city of Bandon, Oregon can be seen on the horizon. 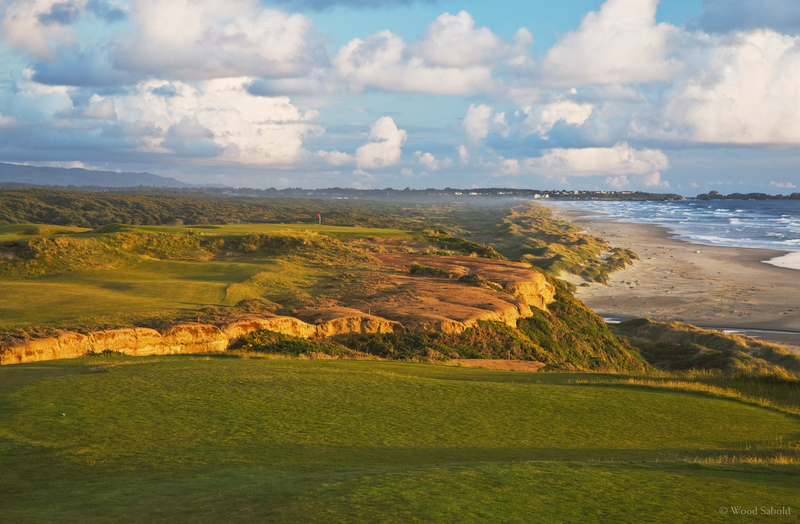 Bandon Dunes Course is the first course of the Bandon Dunes Golf Resort opened in 1999. Course architect, David McLay Kidd, DMK Design. Photo taken 2011.